Stopping Weimaraner Puppy Bad Habits " "
One of the first things you will discover about your Weimaraner puppy when you bring him home is his love for chewing. Understand, not all chewing is bad and should not be discouraged. This is because your puppy will go through a teething phase, and chewing will help to relieve the discomfort in his mouth. Therefore, your job isn’t to stop him from chewing, but to make sure he has the right objects to chew. It is imperative that you provide your Weimaraner puppy with the right chew toys and discourage him for chewing other things around your home. You will not only want to do this to save your own personal belongings, but also to protect your puppy from injury, choking or serous health problems. You can keep your Weimaraner puppy safe from these hazards by making sure the plants in your home are not poisonous to dogs. Get rid of mouse traps. Keep wrappers and small toys off the floor and out of your dog’s reach. Keep electrical cords well hidden so they don’t tempt mischievous puppies. The following are ways you can deter you dog from chewing objects other than his chew toys. Confinement – When you will be leaving your Weimaraner puppy home alone, confine him in a safe area where he won’t be able to get into mischief. The best thing to do is to crate train him. Put a bad taste in his mouth – you will find that pet stores sell products that deter dogs from chewing. The products are usually sprays that you can apply to your shoes, purse, etc. that your dog will find disgusting. When you dog attempts to chew an item, they will only taste a bitterness they won’t like. Watch him closely – Watch your Weimaraner puppy whenever you can so you can observe his behavior. If you catch him chewing on something you’ve labeled as “off limits”, tell him “No!” in a firm voice and take away the item. Immediately after you discipline him, provide him with his proper chew toy. As soon as he starts to chew his toy, praise him to show him this is acceptable behavior. Do not scold your dog for chewing up your stuff if you do not catch him in the act. He will not understand why you are mad at him. Don’t forget that dog’s associate your praise or discipline with the last act they have just committed. Affection and Attention – Play with your Weimaraner puppy and spend plenty of time with him. Include him in as many of your daily activities as you can, and give him plenty of exercise. Many dogs chew excessively when they are bored or are left to their own devices. A destructive puppy is an unhappy puppy. 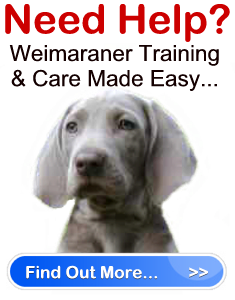 Your goal is to keep your Weimaraner puppy safe and happy. The more time you spend with him, the more content he will be, and the more you will be able to control his habits.